RIO DE JANEIRO, BRAZIL – 21212 Digital Accelerator may be Brazil’s first “start-up accelerator” and has been pioneering entrepreneurship and technology development in Rio for the last five years. The business aims to help start-up entrepreneurs, providing them with capital, mentors, and resources for what it takes to break into the start-up scene. 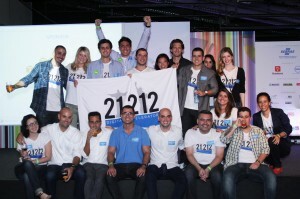 The 21212 team after their last investor day in Rio, photo courtesy of 21212 Digital Accelerator. 21212 is based in Rio de Janeiro, with ties to New York City, as symbolized in their name, 21, the area code of Rio and 212, the area code in New York. With two American and three Brazilian founders, the company strategically uses its bi-national and bilingual background, combining American business models and expertise in the tech-industry with Brazilian innovation. “I was looking to do angel investments myself here in Brazil and I couldn’t find anything. I thought, we are living in the amazing time in Brazil, when the economy is booming and I can’t find anything to invest in? So, we decided to start the first accelerator in Brazil. Now there are twenty accelerators in Brazil, six in Rio,” Carioca founder Marcelo Sales told The Rio Times. “We wanted to bring the Y-combinator model from the U.S. to Brazil, bring the best business practices from the U.S. to Brazil… Show Brazilian business how American business implements ideas, to exchange knowledge between and improve the network between the two countries,” he explained. In the long run, 21212 hopes to foster technology innovation in Brazil, a country not traditionally associated with a thriving hi-tech industry, but proves to be on the rise. Businesses like 21212 and the start-ups they accelerate showcase the potential for the Brazilian tech industry. The beneficiaries of 21212 range from companies like, Oficialize, a company that aids other start-ups in the tactics of conducting business in Brazil’s sometimes complicated legal system to Instaquadros, a company that turns your personal photos into posters, cell phone cases, and more. “We are always looking for strategic investors and partners that will help our company grow its core business. Finding the right partners and investors for Oficialize is a priority for us,” said Ben Hoffman, an American expatriate living in Rio and founder of Oficialize. 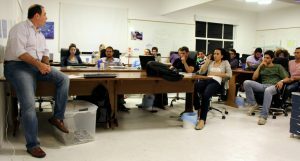 The 21212 office in Botafogo, photo courtesy of 21212 Digital Accelerator. 21212 organizes several events a year to give their start-ups the opportunity to pitch their ideas to investors. This past Monday, the entire 21212 team and eight start-up hopefuls traveled to their first ever investor day in São Paulo. There, heavy-hitting investment banks such as Redpoint, e.Ventures, Performa Investimentos and Initial Capital were in attendance. A total of 200 Brazilian and international investors were expected, ranging from venture capitalists, angel investors, and seed funds. “Investor day is an exclusive event for mostly local investors who want a first opportunity to invest in the start-ups in the early stages of development. Most of our start-ups already have their first or second rounds of capital, and have about R$1 million in investments,” explained Mr. Sales further before the event.